Next time you are at the grocery store, grab a small bag of organic mushrooms. 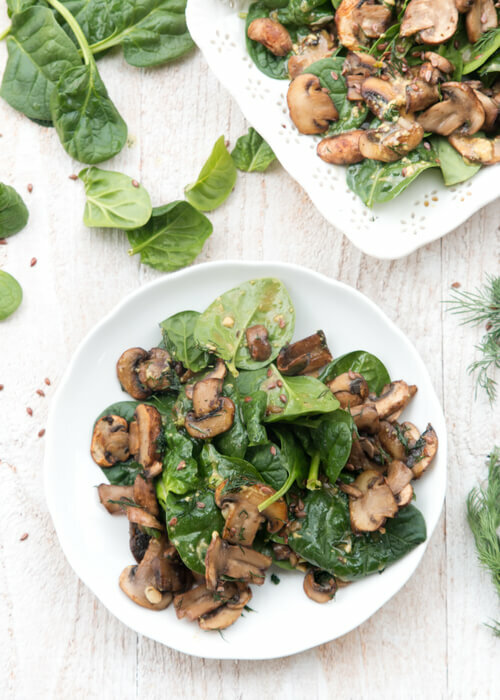 It is not summer yet, and you may not be getting as much as you should be of vitamin D. Mushrooms make a great source of vitamin D, they are exposed to sunlight naturally and generate vitamin D, which enhances calcium absorption and bone strength. They also have the power of boosting your immune system, which is what we need this time of year. This salad is easy to whip up, and truly is delicious. With vitamin K packed spinach, flax seeds and a sweet dijon dressing you sure will be feeling healthy and satisfied. What should you look for when buying flax seeds? Find out in this post here. Heat 1 Tablespoon olive oil in a medium skillet. Add in sliced mushrooms and a pinch of salt. Sauté till mushrooms start getting a brown color (about 5 minutes). Add in minced garlic. Sauté another minute. Add in 1 sliced scallion. Mix together and take off heat. Arrange 1 cup of spinach on a plate. 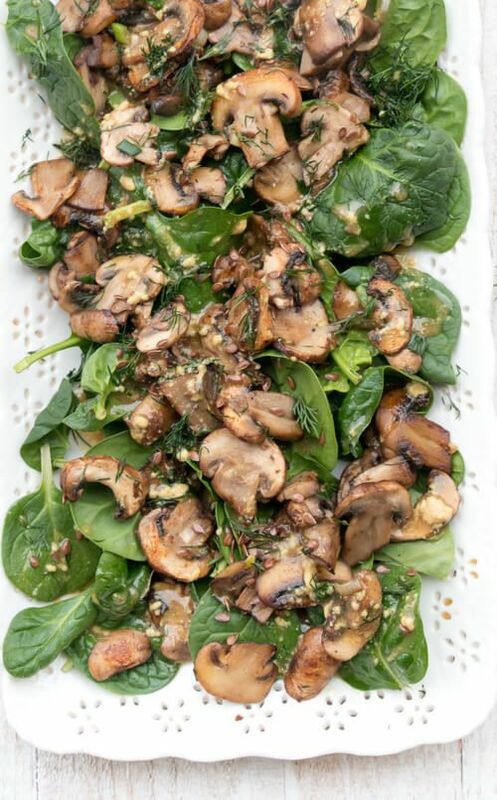 Spread mushrooms on top of spinach. Sprinkle with 1 Tablespoon flax seeds and 1 Tablespoon chopped dill. Salad Dressing: 1 Tablespoon dijon mustard, 1 Tablespoon maple syrup , 2 Tablespoons olive oil, 1 Tablespoon red wine vinegar and a small pinch of salt. Drizzle on salad.